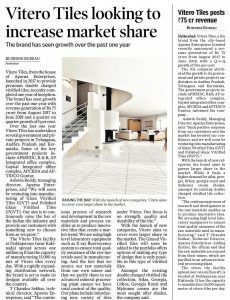 Hyderabad: Vitero Tiles, from the house of Aparna Enterprises, launched in 2017 to provide premium double charged vitrified tiles, recently completed one year of inception. The brand has seen growth over the past one year with revenue generation of Rs 75 crore from August 2017 to June 2018 and a quarter on quarter growth of 5 per cent. Over the last one year Vitero Tiles has undertaken several government and private projects in Telangana, Andhra Pradesh and Karnataka. Some of the key government projects include APMSIDC, R & B, AP Integrated office complex, Gajwal Integrated office complex, APCRDA and APTIDCO Guntur. The Vitero Tiles facility at Peddapuram (near Kakinada) spread across one million sq ft has the capacity of manufacturing 15,000 sq mts of Vitero tiles every day. With a rapidly expanding distribution network, the brand is set to make its designs available all over the country. With the launch of new categories, Vitero aims to cover even larger share in the market. The Glazed Vitrified tiles which will soon be added to the portfolio offers options of making any type of design that is only possible in this type of vitrified tiles. Amongst the existing double charged vitrified tile collection, Atlas, Georgia, Lithos, Georgia Royal and Mykonos cream are the most sought after shades, the company said.